Today, there are colds and allergies in the air, and it felt very much like the perfect time for some purity! A quick coconut ginger kale shake seemed ideal. And some bonus energy lifting with genstones also felt apropos of the moment! 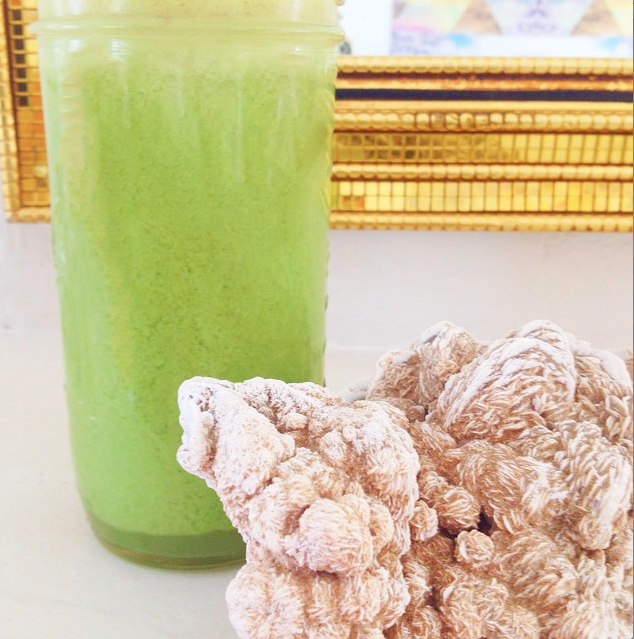 Filled with anti-inflammatory greens, fresh ginger & cinnamon, plus the goodness of coconut, this is a quickie shake if you keep some more pure (I like Natural Value: no guar gum added, tastes really good) canned coconut milk or fresh stuff on hand. Once Fall arrives I am never withour fresh ginger (peel & boil it and make a perfect tea tonic for immunity and anti-inflammatory greatness) or cinnamon (HERE is the cinnamon must-have in my life! ), so I do suggest you keep these stocked. They are really natural food medicine! Now for the quick shake. Ice if you like it frothy and super cold! Blend it all up. That’s it! Now for the energy tip— and a bonus one! If you want to infuse your fall and winter soups, shakes and other tonics with more healing power, there are two things you can try. 1. Actually stir them up while focused on pouring your intention (peace, love, flow, whatever you need) into your food. 2. Place them for a while beside your favorite gemstones before serving to let them absorb some of the naturally radiant energy. you can even put white quartz (an others, but do this carefully) into your water bottle and let it infuse for quite a while before drinking! Previous post: If Your Self-Care Doesn’t Feel Good, It Will Not Work For You! Next post: The New Classic Style Of Soft & Gorgeous Poufs!